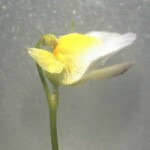 Carnivorous plants, native and cultivated. 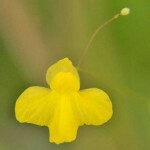 Utricularia, commonly known as “bladderworts”, are a fascinating family of carnivorous plants. 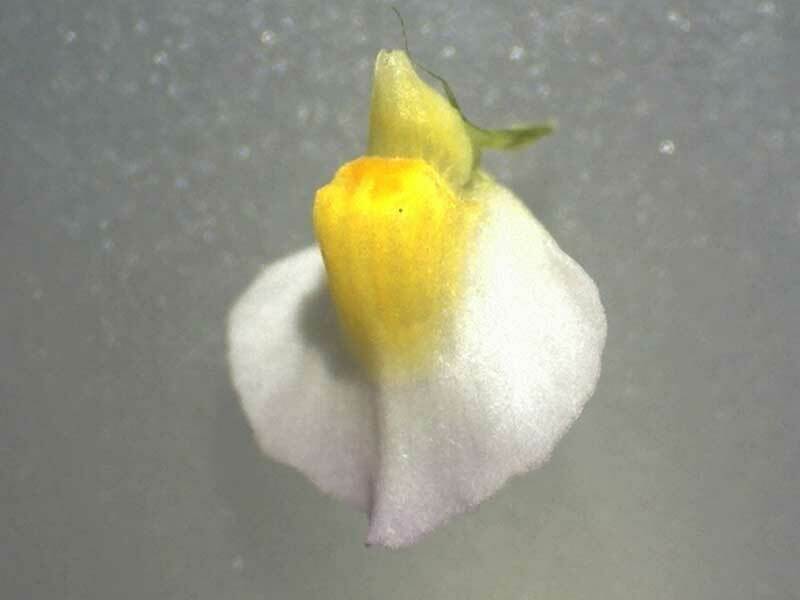 They are frequently so tiny and insignificant that they go virtually unnoticed until they flower. 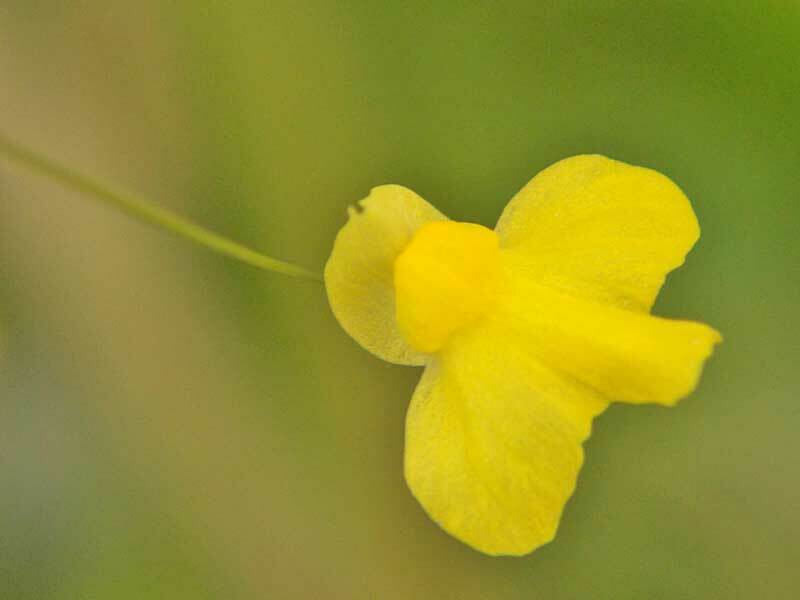 Utricularia supplement their nutrient uptake by catching microscopic animals in tiny bladder-like traps attached to their roots. 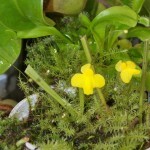 This little gem went completely unnoticed until the first golder flower appeared on a fine stem high above the moss covered pot. The pot belonged to a Sarracenia that was in winter dormancy. 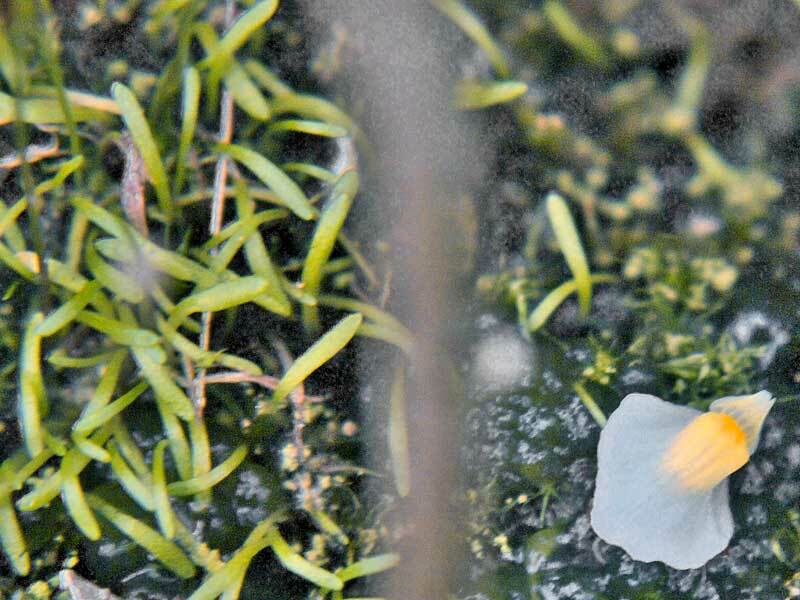 On close inspection yes there were the telltale tiny bladderwort leaves, barely 5mm in length and 1mm across, growing through the moss. 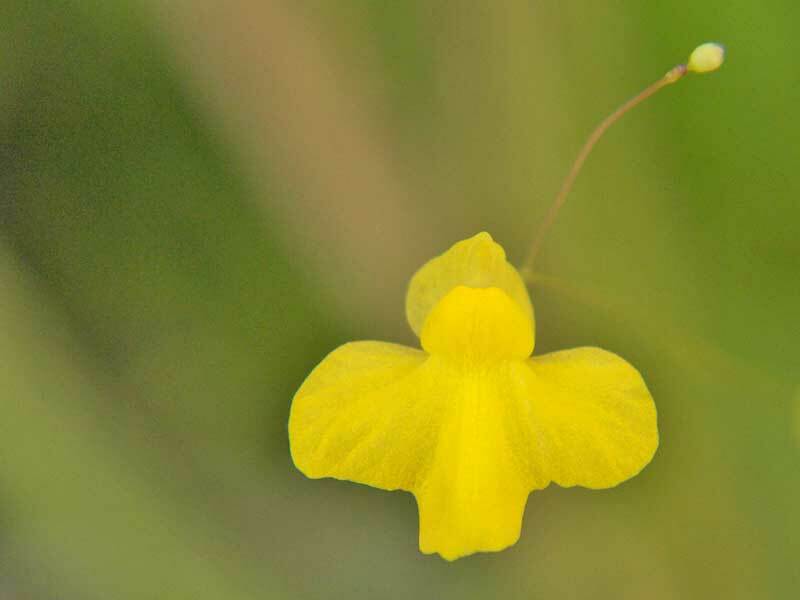 Apparently, and my own observations concur, bladderworts can remain unremarkable and unidentified for years, only putting up thin stems with tiny spherical pseudo-flowers until conditions are just “right”. Then they produce a wondrous display of flowers in shapes, colour and size that is way out of proportion to their diminutive leaves. 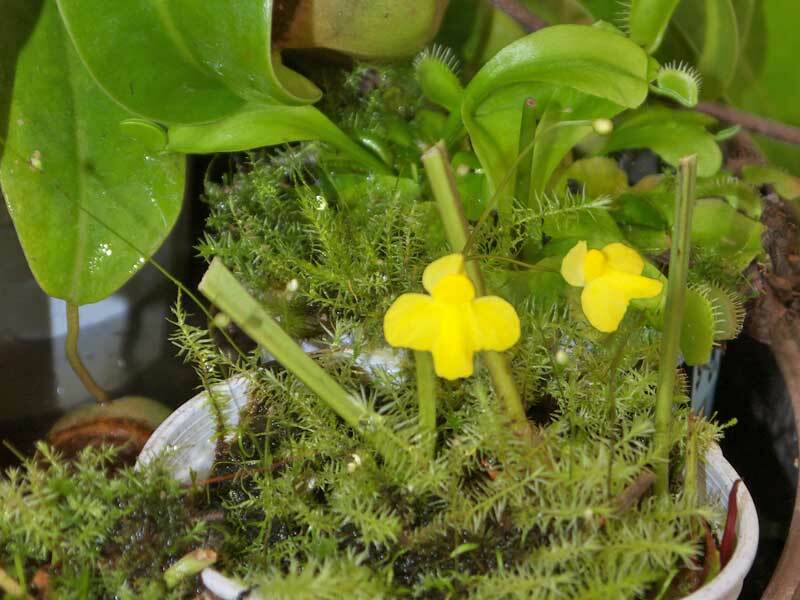 The flowers on this specimen of U. subulata measured 10mm across, rising on a fine stem 160mm above the moss. 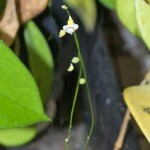 Multiple flowers and buds form on each stem. 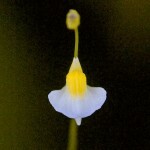 More information on U. subulata can be found at http://en.wikipedia.org/wiki/Utricularia_subulata, and on Utricularia, or bladderworts in general at http://en.wikipedia.org/wiki/Utricularia. Another little surprise. 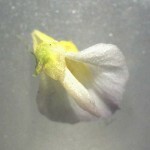 A dainty gold and pale mauve bladderwort flower, half the size of U. subulata at 5mm across. 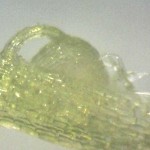 This one was even more difficult to photograph and capture it’s delicate colouring. 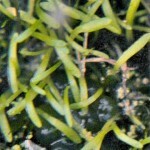 The leaves are virtually identical to U. subulata in size and shape. 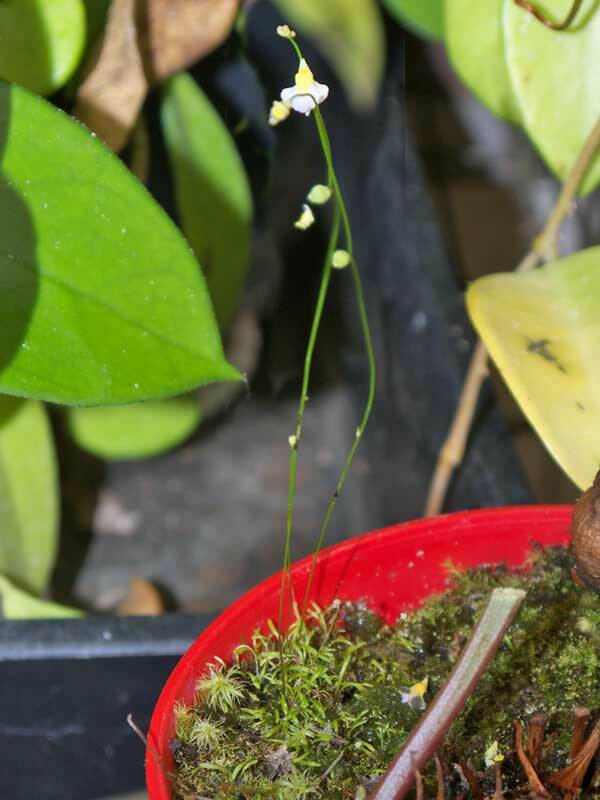 The flowering stems rise a similar height above the pot at 150mm and still going. 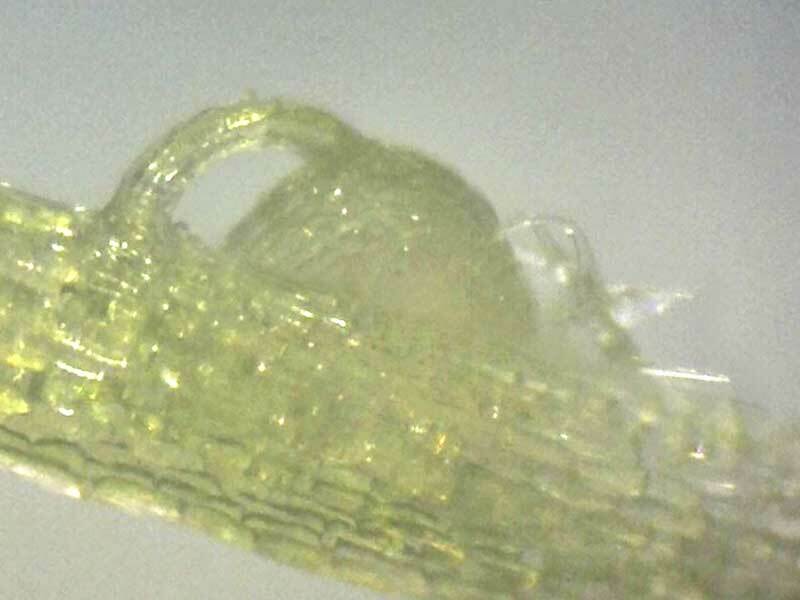 This particular pot of U. bisquamata was sufficiently well established I removed a couple of the leaves and one flower to examine more closely under a USB microscope. 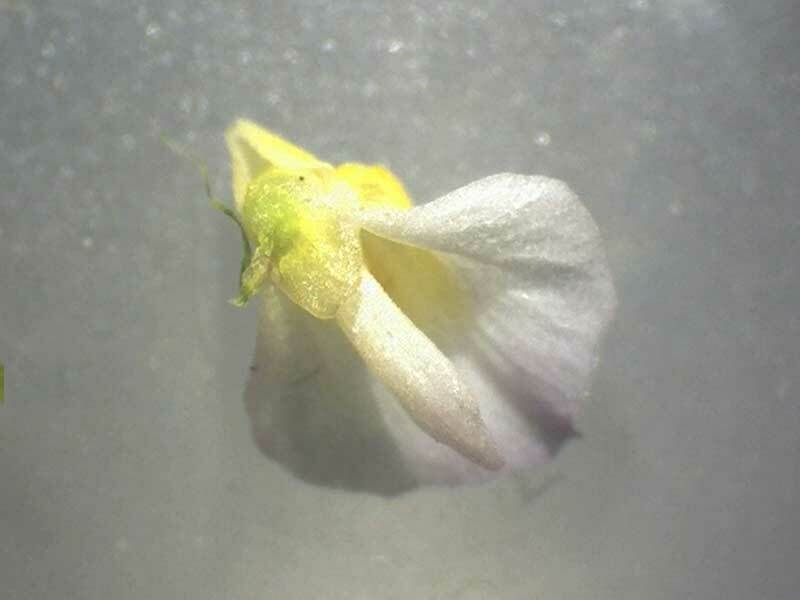 At 10X magnification the shape of the flower is easier see, although the artificial lighting washes a lot of the colour out. 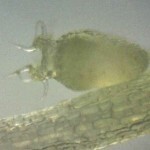 The root system spreads through the wet pot medium, with numerous traps at various intervals. 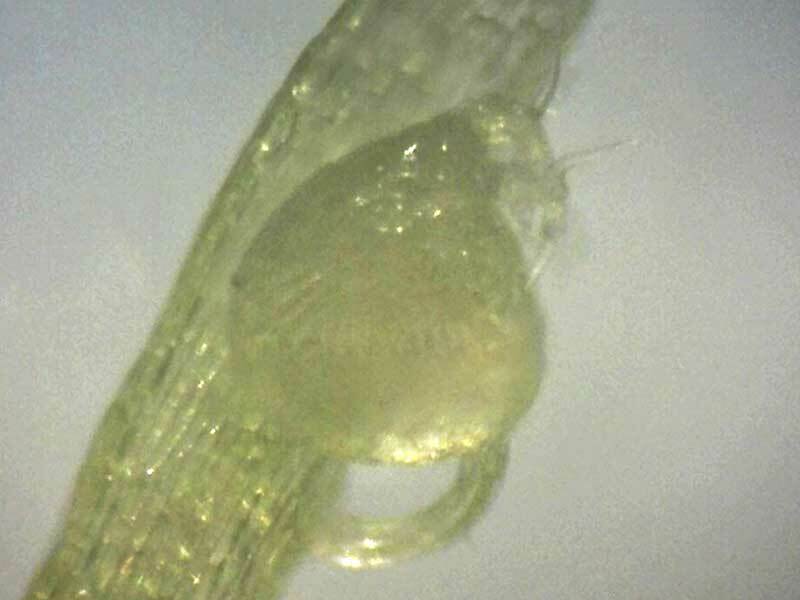 At 200X magnification on the leaf root tip, the tiny traps – one per root in the two specimens removed from the pot – are visible. 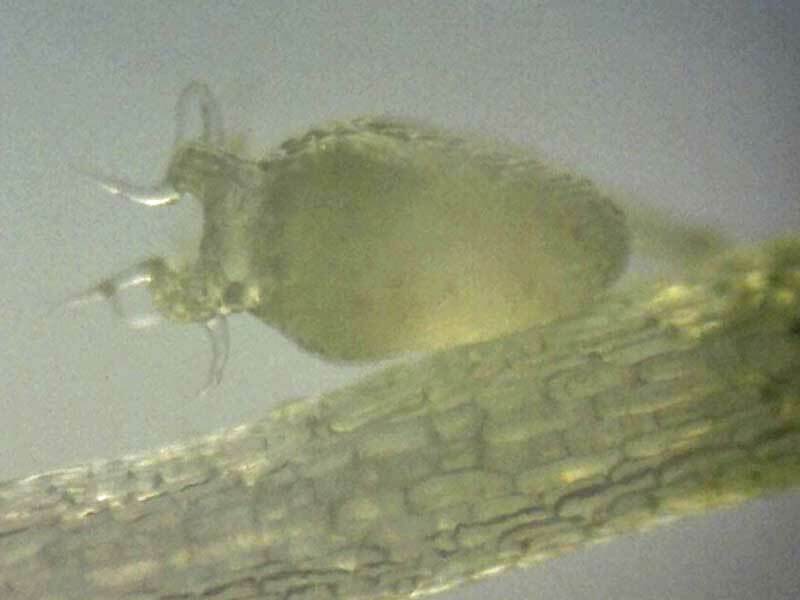 The traps are attached to the root on a short stalk, and appear to have tentacle-like growths around the bladder “mouth” opening. 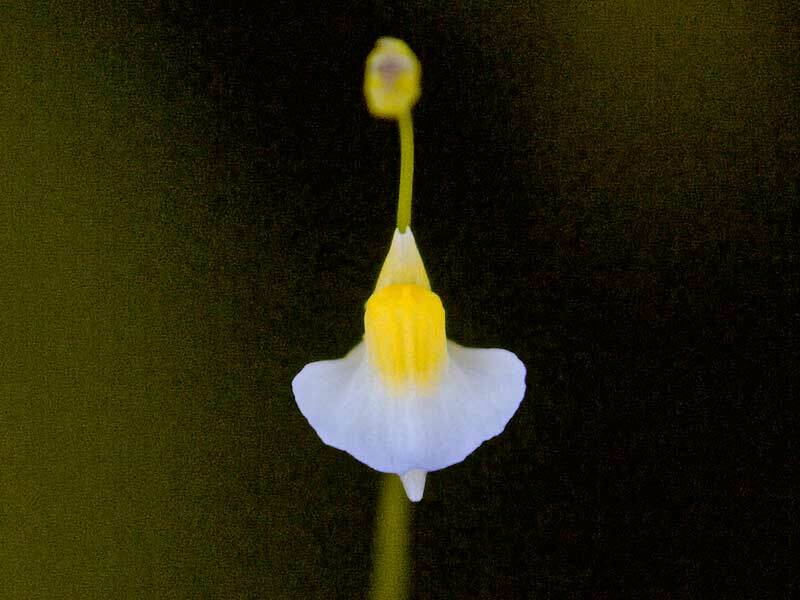 Utricularia bisquamata leaves with a close up lens filter. 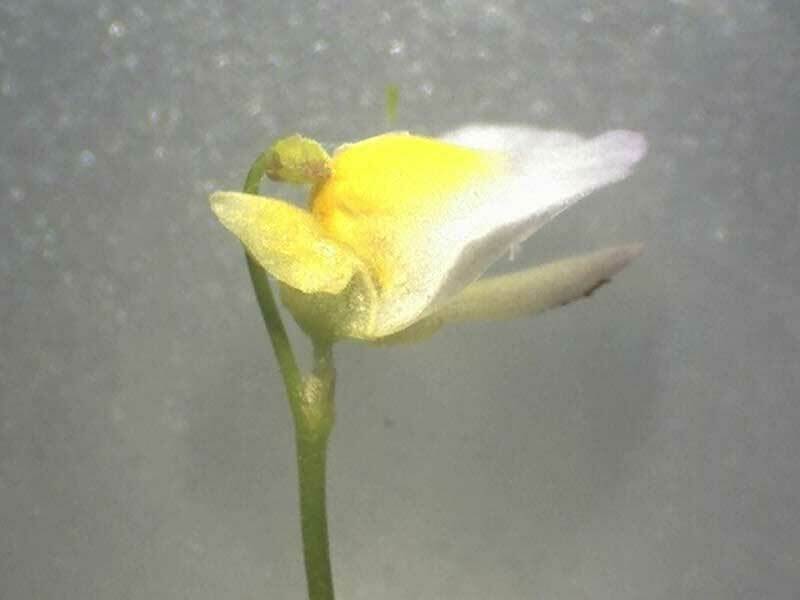 This last image shows the bladderwort leaves – each one capable of being an individual plant with it’s own single trap judging by the two specimens temporarily removed for examination. 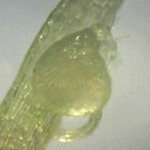 Once the screen captures were made, the leaves were returned to their pot to grow on and form their own colony. 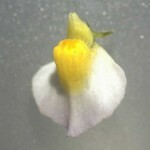 More information on Utricularia bisquamata can be found at http://en.wikipedia.org/wiki/Utricularia_bisquamata.